Most times we are looking for something that could help us to stay a little more organised. If you are wondering what we are talking about, then let us hold back and have a look at our general living. Usually, our daily routines do not really make us realise how certain things stay organised and you do not have to pay much attention or give time in organising them. The reason, being, that we have a set life-style and our brains are programmed to work in that fashion. Like the kids, after getting up, have their beds done or have breakfast with, they exactly know where to place what. Similarly, going outside the homes, it becomes a little hectic for people to stay organised, the obvious reason being that they do not know where to keep what and where to find certain things. The best example for such scenario would be, a person visiting a public facility place such as swimming clubs, gym facility, spa rooms, etc. Such cases can be commonly seen in leisure industries where there is greater demand for lockers. Each locker is made, keeping in mind the demand of that sector. Leisure lockers are pre-dominantly nothing but sports lockers, spa lockers, gym lockers, etc. these are the areas that are called as leisure areas and hence the name. Now, to find the best leisure lockers is really a big task, if someone is holding such facility. Since, the main constraint is that of the space. Some industries or facility units have bigger spaces while some are space crunched but looking at the amount of people visiting the place it becomes mandatory to have proper storage places. The lockers help, to not only store goods or things for temporary purposes but gives a solid peace of mind to the visitors. Namely, the facilities like gyms and spas or entertainment centres are huge spaces where lot of people keep visiting on a daily basis. Sometimes, even with the presence of cameras, one cannot scrutinize the smallest details if anything goes wrong. The lockers help the people to store their possessions while they are using the facilities like swimming or gym, they have unique keys given for their lockers which they can lock and unlock. Why Investment in “Leisure Lockers” is worth it? Leisure lockers as the name suggests, are undoubtedly the lockers used in leisure facilities. The people in leisure industries would already know how pleasurable it is to invite people at the facility without any stress of keeping one’s belongings safe. The lockers are made of hard metals thereby giving good durability and are often resistant to insects or pesticides hanging around the tiny corners. These lockers are custom made hence they can be fitted where there is most desirable place to fit in. Helps to keep belongings safe and locked. Why the demand for Leisure lockers is growing? As we discuss about Leisure lockers, it is very much similar to setting up any kind of rules or regulations at public places. With lockers, although the policies are not written agreements, but people are highly disciplined while handling them. Firstly, they are the property of facility owners and can be used on a rental or free-basis whatever the protocol is. The people in the leisure sector would really vouch for locker systems and with growing amount of gym arenas and sports club, the demand for storage equipment is growing. Investing in Leisure lockers is worth it, because they are one-time investment and also they help to safely tuck away belonging while people are at their work or leisure. The security lockers have security key that is unique to every locker given to the owner for temporary or permanent possession. Often, at bigger facilities there is bigger danger of items getting mis-placed or even stolen hence companies are now investing in lockers to fulfil their customer’s requirement for a safe storage. The leisure lockers are just not limited to the people visiting leisure areas, they are also used by companies for their employees who may require to keep their bags, uniforms and important papers. There are changing rooms everywhere across many industries that require workers to change the clothes. The locker room acts as a great boon for them, since it carries away their hassle of carrying uniforms on a daily basis and important daily use items can be stored in the lockers. The best thing about these lockers is that they are tailored to suit the requirements of the business to give optimum output and satisfaction. However, there is no specific distinguishing factor when it comes to lockers because each locker is made differently depending on the demand of the clients. The coating and finish of the locker may differ depending on the area it is used for. The one thing that is more common amongst all lockers is that, they are made up of hard metals and they do not catch any rust or prone to corrosion. Even with louder shutting, it does not affect their usual working, since they are hard wired to bear the wear and tear to rough use. 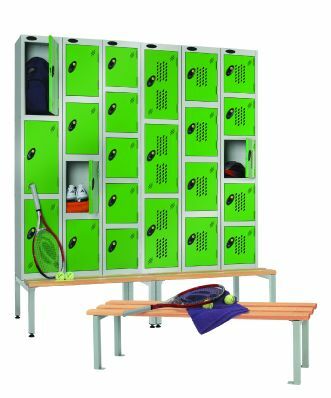 Leisure lockers in general means are also known as gym lockers or spa lockers that are the basic requirements at public swimming pool, chemical factories or laboratories or changing rooms at any facility. The hard coating of the lockers can be coloured according to the background of the place or the brand colours of the facility providing these lockers. The lockers can also be made available to people close to the facility by renting it out. This way, it sets a new avenue for earning extra source of income for the people. It is an upcoming business option if anyone does plan to start a business with little investment. Lockers are always in demand, while there are demands for wooden lockers, too, the demand for hard metals is generally high. Hence, invest only in best quality leisure lockers that stays in good shape for longer period of time and gives flexible use to the members using them. The different types of sports lockers are rustic lockers, bespoke rustic lockers, padlock lockers, dry area laminate door lockers, solid laminate doors, active coat lockers, Z-door lockers, spectrum lockers, timber effect laminate lockers, premium lockers, heavy duty lockers, vision panel lockers, ultrabox plastic lockers, etc. While leisure lockers are generally designed after proper discussion with design teams and then planned. Most times, the characteristics of these lockers are very much similar, for example, the coating, the finish, the spacing inside, the shape, etc. The general use lockers are available in abundance while special lockers are designed if the area requires lockers to be placed in a subtle way. The highly skilled and experienced designed team shall help you get best leisure lockers at economical rates. This entry was posted on Tuesday, April 16th, 2019 at 6:03 am	and is filed under Leisure Lockers. You can follow any comments to this entry through the RSS 2.0 feed. Both comments and pings are currently closed.